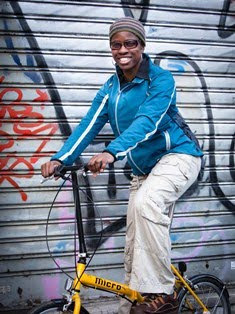 2Wheel Chick: Another inspirational women's hour world record! 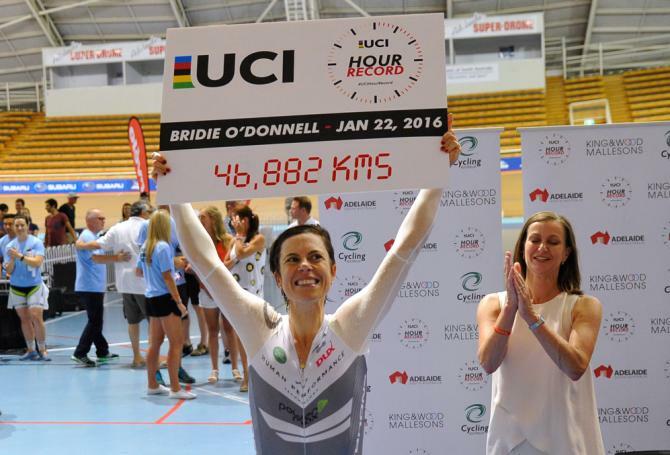 Another inspirational women's hour world record! It's been just over four months since Molly Shaffer Van Houweling broke the women's world hour record in Mexico, and we now have a new standard to beat. 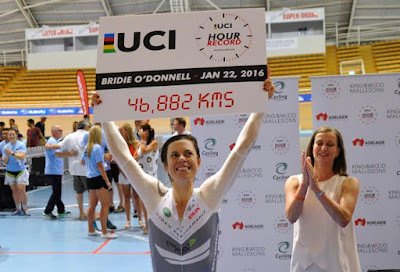 Australian former professional rider Bridie O'Donnell put in a most impressive ride just a week ago at the Super-Drome in Adelaide, to cover 46.882 kms in the 60 minutes - thus breaking the American's record by 609 metres. Add the rides by these two women to the attempt made by Dame Sarah Storey in London last February, that makes 3 attempts at the world women's hour record in less than a year. I think this is a very positive thing for women's cycling. A lot of airtime has been devoted to men's attempts at this record, and women's exploits in this holy grail of performance cycling have been ignored. So it's great that three women have raised the profile of the women's game since last year by targeting the 12-year old record, hitherto held by Dutchwoman Leontien Zijlaard-van Moorsel. What I find particularly impressive is the fact that in the case of the latest two attempts at the hour record, the protagonists were not professional cycle racers. Molly Shaffer Van Houweling is a professor of law at University of California, Berkeley, while Bridie O'Donnell is a former professional who juggles her daily life between amateur cycle racing and working as a physician. For Bridie, according to her blog, preparation for her hour attempt was a labour of love of numerous month. While support came from various players in the cycling world, a number of them gave up their free time to help her. Although Bridie has a pedigree as a time triallist (She is a former Australian National Time Trial Champion), until July of last year she had not ridden in a velodrome. Not useful if you are going to taken on this ultimate challenge! However, when you look at what other activities Ms O'Donnell is involved in it is clear that she is a high achiever. As well as time trial championship titles she is a seven-time national rowing champion, and also completed Ironman Hawaii. This complements awards she received in her medical work too. So, if anyone was going to succeed in breaking a record, on paper Bridie O'Donnell was in pole position to do it. But like with a phrase which I was often told when I lived in France, Il faut le faire. Basically, you have to get out and do it. [Or maybe Just do It, as a certain sportswear manufacturer might say!] It's one thing to be capable, but when you're in the moment and the eyes of the world (or at least a packed velodrome) are watching you it can be quite a scary place and you can easily lose heart. So I say, Grand Chapeau and Bravissima to Bridie O'Donnell. It would be good to see the battle of the hour record continue. A few professional riders have expressed an interest in attempting this record. World Team Pursuit Champion, Joanna Rowsell-Shand, and former World Time Trial Champion Lisa Brennauer among them, though they won't make any steps towards doing so until after the Rio Olympics. This could have left a window open for more non-professional racers to throw their helmets into the ring, so we could see more inspirational rides from women who have dared to dream.